ALT host the OESIG #OESIG (but you don’t have to be a member of ALT to join). Viv Rolfe @vivienrolfe opened up the discussion. It was suggested that OESIG join forces with #OERHub and collate and curate existing resources; and promote http://wikieducator.org/GoOPEN for use and development. Archivist advised use of open software that allowed for portability of resources when repositories disappear. Another participant suggested looking at practice in non-English-speaking communities. There was also a suggestion to support ease of use and finding, and finding ways of sustaining resources that aren’t just located in single HE institutions raising issues of branding. This panel from Vivien Rolfe, David Kernohan, Lorna Campbell, Pat Lockley, Simon Thompson and Leo Havemann explored in different ways how OERs can be sustained. The panel kicked off with a video from Pat Lockley @patlockley, in character as Alex from Clockwork Orange moving on to the decline of OER production, access and use as funding declined, and institutions. The Plight of OER from Pgogy on Vimeo. Questions surfaced issues of sustainability and how it might happen and be supported. Simon Thompson discussed alternatives to official but ephemeral repositories. First he talked about Merlot.org that appears to be sustainable if not fully open and then suggested that Amazon Education could become an attractive alternative for under-funded institutions. This provoked lively discussion. Leo Havemann shared research he did with Javiera Atenas comparing 80 different repositories across 10 quality indicators to see how repositories work? Results were disappointing in terms of scoring on indicators (9 indicators under 50%). Discussion ranged around why this might be, and surprise at low use of licensing. 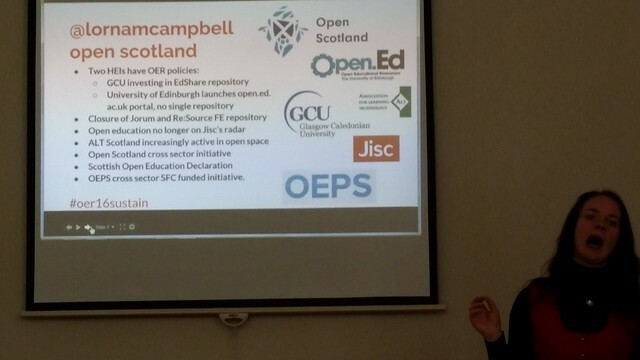 Lorna Campbell explained how the spike in OER shown in Pat’s video related to England, from UKOER funding that wasn’t active in Scotland but that practices and (people) expertise did migrate between England and Scotland that can be seen as a form of sustainability. Lorna speculated that repository activity might increase as it declines across the rest of the UK. Discussion ranged around funding models and their relationship to sustainability. The first presentation was by Lucy Crompton-Reid and Josie Fraser @josiefraser who spoke about the roles of Wikimedians of Residence and models for bringing Wikipedia/Wikimedia into schools, encouraging young people to become producers as well as consumers of knowledge. Kamil Liwowski @kasliwowski kamil@creativecommones.pl spoke about public domain projects in Poland and the difficulties for information seekers searching for the open versions of public domain materials that were often encountered first as paid-for content, not just by individuals but also by public institutions. Teachers may be looking for images that aren’t photos and are free to remix – within 5 seconds. Searching within different collections tends to throw up 1000s of images, making it difficult to choose, sometimes encountering login barrier. Projects work on how to assist teachers on how to encounter and explore the massive, rich digitised cultural connections in contrast with wikimedia resources, located in context, or via bloggers and other social media publishers who act as content curators. Subhashish Panigrahi @subhapa , who works for Wikipedia in Bengalaru, India characterised knowledge as something that starts open and becomes increasingly restricted by copyright. Subhashish contrasted Indian government approach to data and resources as copyright by default with other countries such as UK. This approach increases administrative workload. He encouraged us to consider life without OER , highlighting the Galleries, Libraries Archives and Museums (GLAM) movement that aims to digitise content for cultural studies. 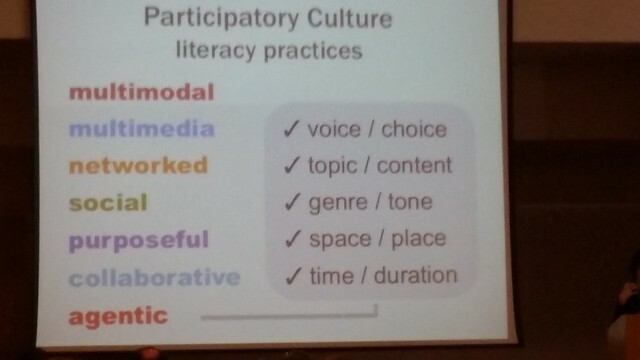 GLAM has shared learning and methodology that is also a resource. GLAM has its own formal training that could be documented better to improve practice across countries. OER movement works by collaboration across individuals and institutions. Scotland’s Museums and Galleries have a national strategy and the project has played a part in fulfilling the strategy. There have also been unforeseen outcomes, including working with educational institutions as well as cultural heritage organisations. They found that participants increased in confidence in working in open knowledge, and will be interested to do more work in future. I looking to the future, Sara thinks we need to have courage and to keep helping people in the sector, but the future holds hope. Catherine Cronin’s keynote was the first session at the OER16 conference and was live streamed with a video recording here in case you missed it, and an audio recording here, if you like to multi-task. Catherine started a conversation around the subject of the keynote more than a month before at her blog and #OER16 on Twitter, indicative of her commitment to open scholarship. The conversation attracted 27 comments so the engagement long preceded the actual keynote. She started her keynote by situating her own scholarship within a network of scholars, many of whom were in the room (or on the #OER16 hash tag), and acknowledging earlier scholars like Mary Somerville and other influences such as poetry e.g. @byleaveswelive. Catherine spent a few minutes promoting networking by encouraging us to talk with someone we didn’t already know. 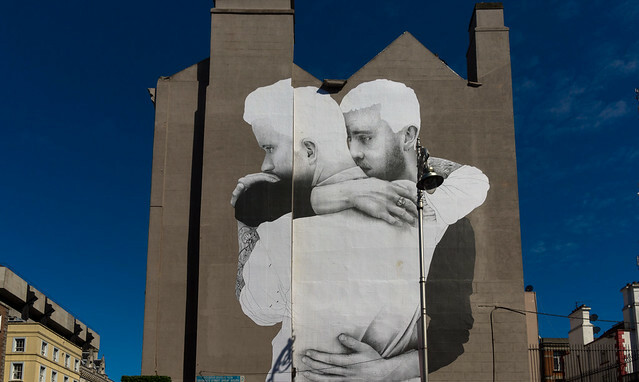 Catherine showed mural that evoked the popular movement around the Irish marriage referendum #marref and the role of social media in this movement, encouraging people to vote, and even come home to vote from all parts of the world. She acknowledged work done by Richard Edwards; and by Sava Singh, Jeremy Knox, Suzan Koseoglu and others speaking at #OER16. In her PhD research, Catherine has come across how important it is for people to balance privacy and openness. Openness is personal – with decisions to be made about whether to share , with whom, as whom, and what to share. One question probed whether or not Open Educational Practices are moving apart from the Open Educational Resources in the title of the conference. Catherine saw her input as equalising the emphasis rather than eliminating the importance of the content/ resources. Another question asked about the permissive nature of multiple definitions of openness and stressed the importance of freedom flowing from open. Catherine stressed the importance of context, in exploring who may be left out. “Move from access to equity and justice” McMillam Cottom, 2015. The last questioner homed in on the issue of Open Textbooks and their role in such a move if used to deflect funding in public education. This keynote was a fine start to the conference. 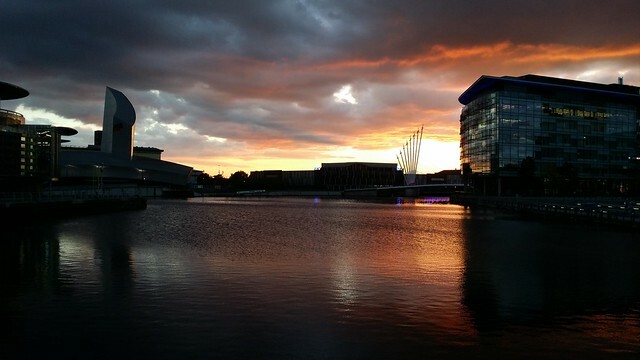 When I attended the DCDC15 Conference – DISCOVERING COLLECTION DISCOVERING COMMUNITIES in October, I was struck by the potential for the Cultural Heritage and Open Education communities to learn from each other. I was particularly interested to hear about the Digital Bodleian Library that uses the IIIF standard and is based on open standards, open access and open software. The strategic advantage of open, creating a culture of openness, and the reputational challenges of openwashing. 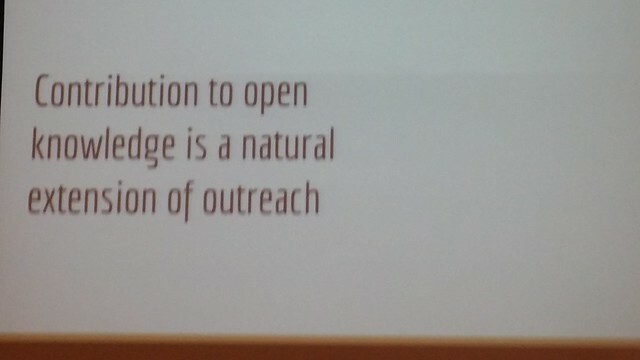 Converging and competing cultures of open knowledge, open source, open content, open practice, open data and open access. Innovative approaches to opening up cultural heritage collections for education. OER16 will take place at the University of Edinburgh on the 19th and 20th April 2016. The deadline for submissions is approaching rapidly and the site is now open. That is still time to write a 250 or 500 word abstract for presentations, lightning talks, posters, and panels and workshops but who knows there might be an extension. You can follow @oerconf and #oer16 on twitter.